Every year, I go to the San Francisco Dickens Faire with my best friend and her family. It’s an amazing Dickens Faire because everyone dresses up. There is an Irish dancing pavilion, authentic fish ‘n’ chips shops, carolers, re-enactors of various Dickens works, and much more. The entire décor and setup is so realistic that it really does feel like you’ve been mysteriously transported into the Dickens world. All the people who visit the Faire sell hand-made goods that are unique. My family actually has a history of attending Dickens/Renaissance Fairs, as my father used to man a small shop at a renaissance faire where he sold flower garlands. The Dickens Faire will be the perfect place for Chapel, of course, whose amazing knowledge about fashion and historical costume dramas will probably make her an interesting conversational partner for some of the other Faire-goers – but we’ll have to see what happens next week, won’t we? Do any of you have historical (or just general) fairs or markets you like to attend? Share your stories below! In Jakarta where I live, there's always a Japanese bazaar several times a month. My old college (and other colleges with Japanese language major/faculty) always hold matsuri or Japanese festival once a year. People dress up Harajuku style or wear kimonos and yukatas in these occasions, and they can eat Japanese foods and buy Japanese stuff. Most schools and offices hold the Kartini Festival every year on the 21nd of April. Look her up, she's our national heroine who fought for the rights of girls to education. People wear traditional batiks and kebayas in this event. There's also the Chinese New Year, where people can dress up Chinese-style and watch the Lion Dance. Also, rarer than Japanese bazaars, there are Chinese bazaars in other ocassions. Wow, you live in Jakarta! I love that Chapel is reaching that far. I've never heard of the Kartini Festival before but it sounds fantastic that there's a celebration of women's rights. The festivals and celebrations were you live sound wonderful!! I live near SF, so I go to the Dickens Faire too! Mostly, though, I don't wear a period costume because I would probably have to wear a dress (UGH times a million) or something to do with breeches. You SHOULD wear a period costume! It's fun! Why not dress up in a suit like a Sir then? I used to go to a really fun "Shakespearian Festival" when I was in High-school and into my college years, but these days I've only been going to a couple of Renaissance Festivals. I spend months designing and creating my costumes, though, so the festivals are a good outlet for my obsessiveness where costuming is concerned. Oops, didn't realize it would kill the link I'd pasted in... if you want to see my costume, go to Flickr and search for "NefariousDrO". I'll have to go look! That sounds like an AMAZINGLY fun festival experience!! ahaha! I love Barnaby's just-woke-up look, you really captured that! As far as I know, we don't have any in Western MA, but you know...maybe I'll get the chance someday. I'm glad you noticed Barnaby's look, I really wanted to capture that well and I'm so pleased I succeeded! It would be amazing if you could go to a fair like the ones we've been discussing...if you find one near you, let us know, because we can give you tips! That sounds like so much fun! What a neat thing to have weekly meetings, instead of once-a-year fairs. What sorts of activities do you do? Pitched Battlegames and fighter's training, music practice and performance, crafting workshops (we have at least three competitions a year) and general socializing - in costume. Then every three months or so we have a camping event where we hold "court," hand out awards, perform our music or dancing and generally have a really good time. I want to attend a Dickens faire in CA. How can I find out where and when they are? slight question Miss Emma. Why are chapel and barnaby brushing their teeth at a table and not a sink? It technically doesn't make sense, but because I usually draw a table at other parts of their house, I included it in the bathroom as well. Sorry guys! I haven't been on here in FOREVER! I'm back at school, first of all, but I also recently got a twitter account and have been on that quite a lot...heh. SORRY! good to hear from ya! welcome back! I live in Telford (England) about 30 mins walk from a place called Blists Hill, a Victorian open air museum where everybody working there is in traditional clothing. I used to volunteer down there during my summers at uni. Some of the greatest weeks I'v ever spent. That sounds amazing, what a wonderful place! It's also incredible to hear how many of you Chapel readers are from countries other than my native United States...I love museums, especially open air ones! You do indeed have a very odd and wide spread fan base. If you should ever be in the Houston, Texas area in early December, the city of Galveston hosts what they call "Dickens on the Strand" (the Strand is the main commercial street of town). 2012 will mark the 39th year of the celebration. That's so cool! Do you go there and/or wear a costume? What's your favorite part of your Dickens celebration? Never have gotten there myself (I live four hours away), but if my wife ever builds me the frock coat and trousers that she threatens periodically, it might happen. Wow, that's amazing! Maybe I'll see you there, that would be so amazing if I saw any Chapel readers at the Faire! That's a shame...you'd think there'd be lots of celebrations like that in NYC, but maybe the space issue comes into play...in SF we have an ENORMOUS building called the "Cow Palace," which is more than large enough to host an entire Dickensian village. Chapel's outfit is so perfect and beautiful. I love the color scheme! (Is this my best friend Grace or another Grace?) Anyway, thank you so much -- I had way too much fun drawing Chapel's costume, which is probably quite evident. We do have a "Dicken's of a christmas" even in my city. but that's about it. We do however had (it's off line for a bit, i hope it'll reopen soon) a re-creation of the colonial age life down to the clothing, a working farm, and living buffalo and other farm animals. it predates Dicken's age, so it leans more to my intrest in history. Oh, that sounds fascinating! What a neat event that your town puts on! i haven't been there much. considering they have those buffalos at the place, i am forced to remember my last encounter with possably deadly 1 ton+ herbavore quadrapeds. needless to say, i do not cherish that prospect at all. Oh, my grandma lives in Oregon! (Near the Portland Area, though.) I've also been to the Shakespeare Festival, as my middle school hosted a trip there for the seventh graders back when I was that age. None of us dressed up as it's more formal when you go to the plays. 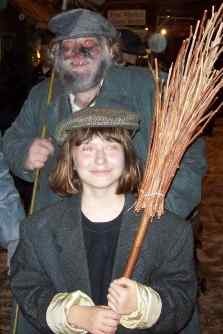 And the chimneysweep was very nice! I didn't know him, but you sort of talk to and take pictures with lots of interesting strangers at the Faire. I often end up at the various irish/celtic fairs in southern california due to my ties . Notably the ones at Irvine, The Queen Mary, and Pomona. Although, the last couple of years I haven't ended up at any of them. odd. I've heard of a couple Irish fairs in California, because my best friend's family goes to them (they're the same family who takes me to the Dickens Faire). Are they fun to go to? Yeah, they can be fun to go to. I go to Dickens, Scottish Games and Renisseance Fair in Pleasanton, the Renisseance Festival in Casa De Fruita, and the Pagan Festival in Berkeley. And any other similar ones I can find! Do any of you have suggestions for festivals in California? What fair a the Cloisters? It sounds fun! I'm glad you like the strip! What particularly makes it funny to you? I've never been to anything like that, but each year a town near ours has a Pumpkin Festival in October, and usually me and my dad try to go. It's really neat because there are lots of old buildings there, like schools, a blacksmith's shop, a real jail with barred windows, and a big, beautiful house. On the upper level of the house are old rooms with antiques for sale, and on the lower level there's a little room where you can buy handmade candles and things like that; there's also a little diner on the lower level that has the most amazing ice cream. Sometimes they have animals there too; once they had a baby zebra and a camel. :D It's a little different every year, but I love going. Wow, that sounds so great! I wish there was something like that in California (where I live). The antique shop especially sounds like something that would be right up my alley! It's cool that the Pumpkin Festival has other stuff besides pumpkins, too. Were there any Jack the Ripper? That's weird to me. I'm British and our village organises a Dickensian Evening but over here they are always held around Christmas, ours is always the first Friday in December. All the local clubs and charities have a stall selling food, drink, knick-knacks and things but the only people who dress up are the carol singers. Renaissance fairs are fun! My best friend and I spend five weeks making costumes for one last year! Wow, FIVE WEEKS! What sort of costumes did you make? Traditional ones only dressed up, skirts, puffy shirt (I don't really know how to explain it), heavily embroidered vests that laced up in the front and purses, three purses. that hat worked ok for you Miss Emma, but that jacket? not so much. It was too big, since it was from the thrift store. You should try one! They probably have them where you live, since they're quite widespread!